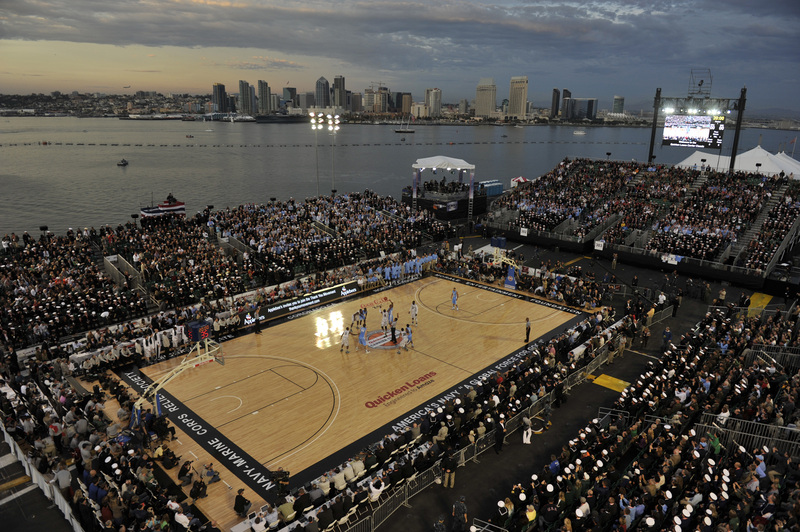 It’s been a few days since any NCAA teams played basketball on an aircraft carrier. Never too early to think about the next time, right? The inaugural Quicken Loans Carrier Classic appears to have gone off without a hitch, as an outdoor hoops arena went up from scratch, a president made a cross-country visit … and somewhere along the way, the top-ranked North Carolina Tar Heels managed a 67-55 win over Michigan State. So, what about 2012? This USA Today report outlines some of the details, including the proposed date (Nov. 9, apparently ending the play-on-Veterans Day streak at one), the potential matchup (Connecticut’s in, Arizona could commit next), and a possible doubleheader in 2013 that would feature men’s and women’s games. One likely fix for next time: According to the USA Today report, contingency plans to play the game on the hangar deck in the event of harsh weather never fully materialized. Had there been rain, the game could’ve been called off. This ESPN blog post chronicles the problems with the covered arena. Well, there’s a few hundred days left to work things out.